Section of an embryonic day 4 mouse embryo implanting into the uterine wall. It is immunostained for the cell adhesion molecule E-cadherin (red), transcription factor Yin-Yang1 (YY1; green), and DAPI nuclear stain (blue). The uterine epithelium, delineated by E-cadherin expression, surrounds the mouse blastocyst which is expressing high levels of YY1. The blastocyst consists of the inner cell mass (which forms the embryo proper) surrounded by the trophoblast which contributes to the placenta. In this image on the right side of the embryo, the trophoblast cells opposite the inner cell mass, called mural trophectoderm, have begun to invade the uterine epithelium. 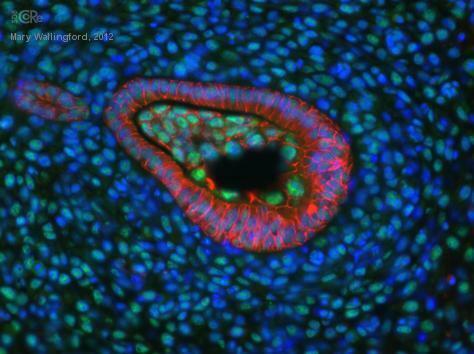 This image was the 2012 Developmental Biology Student Cover Competition winner (Vol. 367, Issue 2). Trask M.C., Tremblay K.D., Mager J. Yin-Yang1 is required for epithelial-to-mesenchymal transition and regulation of Nodal signaling during mammalian gastrulation. Developmental Biology, 2012, 368:273-282. Gilbert, S.F. Developmental Biology. 6th edition. Sunderland, MA, Sinauer Associates, 2000. Early Mammalian Development. http://www.ncbi.nlm.nih.gov/books/NBK10052/. You must be logged in to CoRe to comment. Please login or create an account.